She's interviewed "glamazons," watched stars shine (Sharon Stone in a Gap T-shirt at the Oscars) and bomb (Jennifer Aniston in dreadlocks, Cher in an Egyptian headdress), and witnessed many a celebrity rise to the top only to come crashing down a mere year later. And she's both reveled in kudos and despaired over criticism of herself. As the daughter of Joan Rivers and with years of face time with the Hollywood elite, Melissa has learned far more than your average person about what it takes to be a star--not just on the red carpet, but in life. For the first time, she shares the lessons she's learned along the way and teaches you how to embrace your big moments, be it a graduation, a first date, a job interview, a prom, or a wedding. Pulling from inspirational and humorous tales from her probing chats with red-carpet royalty and episodes in her own life, she lays out nine essential rules to seize momentous times with graciousness, fun, preparedness, confidence--and, of course, drop-dead gorgeous style that flatters you. (Hint: It's not always the top designer brand that'll scream stardom.) The walk down the red carpet, as Rivers so colorfully relates, can teach us all some basic but essential lessons in fashion and in life. 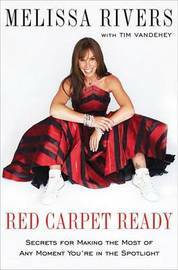 With miles of red carpet under her belt, Melissa Rivers has seen it all, from the biggest oops! moments to those unforgettable times when a star truly did shine. She knows exactly what it takes to be a star--both on the red carpet and in life. MELISSA RIVERS was born in New York City and grew up in Los Angeles. She graduated from the University of Pennsylvania with a degree in European history. Melissa's extensive television background includes working as a features reporter for "CBS This""Morning; "being a regular contributor to MTV's "Hanging with MTV; "serving as a television host and producer for the E! network and as a host for TV Guide Channel's event programming; and, most recently, as a contestant on "The Celebrity""Apprentice." She lives in Los Angeles with her son, Cooper.